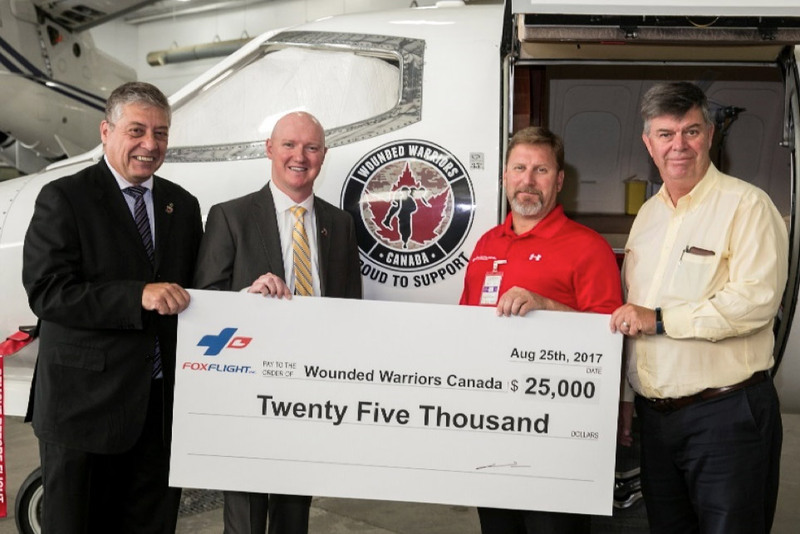 (Toronto – September 1, 2017) – Fox Flight’s Air Ambulance, a Toronto-based international medical repatriation company, recently made a $25,000 donation to Wounded Warriors Canada. The funds will go to help support mental health programs for ill and injured Canadian Armed Forces members, first responders and their families. This initial donation is the first installment of a funding commitment that will see Fox Flight contribute a total of $100,000 to the charity over the next five years. (l to r): Phil Ralph, National Program Director, and Scott Maxwell, Executive Director, Wounded Warriors Canada; David Fox, President, and Ian M. Smith, CFO, Fox Flight Air Ambulance. This year Wounded Warriors Canada will invest approximately $1.8M in a variety of mental health programs. In addition to its financial contributions, Fox Flight has also agreed to display the Wounded Warriors Canada logo on each of its four Learjet air ambulances to help raise awareness about the charity across Canada and around the world. Founded in 2006, Wounded Warriors Canada is a national mental health charity whose mission is to honour and support ill and injured Canadian Armed Forces members, Veterans, First Responders and their families. The organization provides a wide range of programs and services for individual members and their families affected by Operational Stress Injuries. As a privately funded charity, the organization is made possible thanks to the care, compassion and generosity of Canadians and Canadian businesses from coast-to-coast-to-coast. Visit www.woundedwarriors.ca. Founded in 1997, Fox Flight Inc. is a Canadian air ambulance company providing international, 24-hour, emergency medical transport, bed-to-bed stretcher evacuation and onboard patient transfer services on commercial flights. Fox Flight has its head office and hangar facilities in Toronto. The company employs a staff of fully licensed physicians, nurses and respiratory therapists, as well as highly experienced pilots and aviation maintenance technicians. Fox Flight’s fleet of dedicated, fixed-wing air ambulances consists of specially configured Lear 35A and 36A jets equipped with the latest in advanced intensive care medical technology. Fox Flight maintains full global EURAMI accreditation. Visit www.foxflight.com.